Cromwell is between State Highway 6 (linking to Wanaka, 50 km north, and Queenstown, 60 km west) and State Highway 8 leading to the Lindis Pass, 75 km northeast, and Alexandra, 33 km south. The road to Alexandra winds through the Cromwell Gorge. A point near Cromwell lies 119 kilometres from the sea, the farthest from the sea anywhere in New Zealand. A prominent feature surrounding much of the town is the man-made Lake Dunstan. Cromwell also has the newly constructed Highlands Motorsport Park. Nearby settlements are at Bannockburn, Lowburn, Tarras, and Ripponvale. Cromwell is also the home of the Cromwell Chafer Beetle (Prodontria lewisi). The 45th parallel south runs just North of the township. Cromwell was originally known as "The Junction", being at the confluence of the Clutha and Kawarau Rivers. In 1862, gold was discovered below the Junction by two miners, Hartley and Reilly. Once the word of a gold strike was out, there was an influx of several thousand miners to the area. Its newspaper, The Cromwell Argus, was established in 1869. As gold ran out, Cromwell became the service centre for an extensive farming and stone fruit growing area. It has a strategic location between the Lindis and the Haast passes, and acts as a hub between the towns of Wanaka, Queenstown and Alexandra. The former is commemorated with the giant sculpture of stone fruit which stands outside the northern end of the town. Cromwell lay at the confluence of the Clutha River and Kawarau River, which was noted for the difference between the colours of the waters of the two rivers and also for the historic bridge at the convergence of the two. Since the construction of the Clyde Dam and the filling of Lake Dunstan in the early 1990s the river confluence was drowned, as was the old town centre. The decision to build Clyde Dam and use Cromwell as the accommodation base brought many changes to the town. Approximately one-third of the town was rebuilt on higher ground. The changes included the doubling of the residential area, relocation of the old town centre (now called "Old Cromwell Town"), upgrading of services, and the provision of modern educational and sports facilities, and a new bridge. The relocated town centre, or "The Mall," now houses the main retail, service and civic buildings in Cromwell. Several of the old buildings of the town which escaped the flooding have been retained as a historic precinct close to the shore of the Kawarau. The town was named after Oliver Cromwell and, as well as "The Junction", the town was previously known as "The Point" and "Kawarau". Cromwell is nicknamed the "Fruit Bowl of the South". Cromwell has five pre-school facilities, two primary schools and a co- educational secondary school. An Otago Polytechnic campus specialises in horticulture, catering and tourism. Its crop centre provides advisory services to horticulturalists on commercially viable new crops. Cromwell receives around 400 mm of rain a year due to its inland location. Although it is widely believed to have a continental climate, the town officially has an oceanic climate (Cfb) with rainfall just enough to escape the semi-arid climate classification. The sign on the south side was reconstructed from the original suspension bridge's pillars. An historic town which was once the centre of a thriving and successful gold mining industry. Remnants include the hotel, Post Office, Stewart's store, and many old dwellings. Now a restful area centred on viticulture and agriculture. Walk through an incredible landscape changed by hand in the pursuit of gold. The round trip is full of history and interest. Bendigo was a successful quartz mining area for over half a century. From the site of the old Bendigo township at the top of the Bendigo Loop Road a steep, narrow vehicle track winds up into the hills to Logantown and even further up to Welshtown, where some of the most striking remains of old stone cottages can be found. The ruins of Carricktown are 4 km up a 4WD track from the old mining area of Quartzville (near the end of Quartzville Road), and the Young Australian 6m overshot water-wheel can be found a further 3 km on. The track continues up to Duffer's Saddle. Return down Nevis Road to Bannockburn. Hartley and Reilly first discovered gold at the beginning of this rugged and spectacular gorge. The construction of the Clyde Dam created Lake Dunstan, which consumed part of the old Cromwell town. The deep river gorge, famed for its picturesque beauty, lined with orchards and vineyards, and especially the meeting point of two distinct rivers, was reformed with an artificially constructed shoreline. Though the original orchards were lost, Cromwell's climate has allowed it to maintain its reputation for wine and fruit production. ^ Cook, Marjorie (11 February 2009). 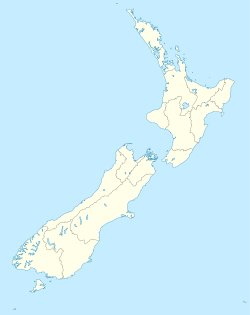 "Revealed: New Zealand's furthest inland point". Otago Daily times. ^ Griffiths, George. "Fenwick, George". Dictionary of New Zealand Biography. Ministry for Culture and Heritage. Retrieved 8 January 2019. ^ . NIWA. 2014 http://cliflo.niwa.co.nz/. Missing or empty |title= (help) Retrieved on 22 March 2015. Wikimedia Commons has media related to Cromwell, New Zealand.